Monica appreciation for nutrition came as a result of her own personal relationship with food. As an athlete, Monica was self-aware how her performance on the field and her body were affected by food choices. Shortly after Monica was working in the nutrition industry, her mother suffered a heart attack. Monica instantly sprang into action by carefully preparing a personalized diet and a targeted supplement program-which saved her mother’s life. Monica is a proud mother of a teenage girl who has life-threatening food allergies. Monica creates allergy-friendly, nutritious recipes that all family can enjoy, she also develops individualized supplement programs to ensure healthy growth. Monica understands the challenges of families of children's with food allergies and she helps them to overcome these difficulties. Mrs. Amsterdam specializes in functional nutrition, chronic disease prevention, and health promotion. She also works closely with some of the best physicians in the Tri-State area. As a Functional Diagnostic Nutrition practitioner, she employs the latest functional testing, and the evolving scientific medical developments to identify malfunctions and underlying conditions at the root of most common health complaints. Mrs. Amsterdam was trained in more than one hundred dietary theories and studied a variety of practical lifestyle coaching methods. Monica’s main goal is to maximize whole body function at all levels such as cellular, genetic, emotional, mental and physical. Drawing on this knowledge, she helps her clients to create a completely personalized “roadmap to health” that suits their unique body, lifestyle, preferences, and goals. 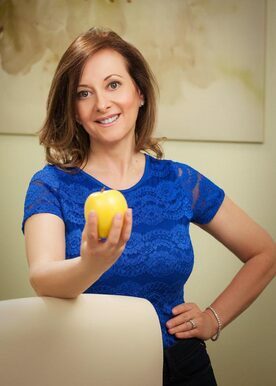 She believes in educating her clients and she encourages self-responsibility for health, using food to maintain well-being. In addition to the therapeutic use of food to support the body’s innate ability to heal, she may recommend the utilization of targeted vitamin and nutrient therapies. Allergies, asthma, autoimmune disorders, brain fog, chronic fatigue, dermatitis, fibromyalgia, irritable bowel, migraines, memory issues, recurrent infections, weak immunity and various other health problems generally have a primary nutritional and/or toxin imbalance as a root cause. Monica is currently studying Naturopathy and she continues to educate herself through various seminars, certification programs regarding nutrition and health studies. Monica has been featured as a nutrition expert in top-tier publications, including: Yahoo! News, Bustle, Delish, The Huffington Post, Eat This, Not That!, Whole Foods Magazine, U.S. News & World Report, and MSN Lifestyle just to name a few. Additionally, Monica was a guest on televised programming, including: NJ12 “12 To Your Health” and WCBS-2 “This Morning” and “News at 5”.